(PhysOrg.com) -- On May 20, 2009, former NASA astronaut and Ames employee Scott Parazynski became the first person to have been to space and to climb to the summit of Mount Everest. On his way to the summit Parazynski was able to capture several photographic panoramas from record-setting heights. 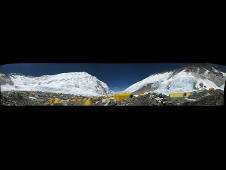 Keith Cowing was stationed at Everest Base Camp for a month so as to collect and relay Parazynski's progress to friends and followers. Cowing and Parazynski are both members of the Board of Directors of the Challenger Center for Space Science Education (http://www.challenger.org) headquartered in Alexandria, Va. To read more about their expedition, visit: http://www.onorbit.com/everest . GigaPan was developed by Carnegie Mellon University in collaboration with the NASA Ames Research Center's Intelligent Robotics Group, with support from Google, to create high-resolution panoramic images. GigaPan Systems was established in 2008 to bring this powerful, high-resolution imaging capability to a broad audience as a commercial spin-off. great pics. you can see that their VHF radio antenna is broken off just over the loading coil.